Did you know SuperPhillip Central is quickly approaching its 800th review? Check out the current total with the SPC Review Archive! Meanwhile, it's time to add to the review count of both quantity and quality with a 3D platformer that had the misfortune of releasing close to Super Mario Odyssey. It's Poi: Explorer Edition for the Nintendo Switch. The 3D platformer has seen a resurgence in gaming over the past couple years. One system is seems right at home for is the Nintendo Switch, due to the history of the genre being extremely popular on Nintendo platforms, most specifically the Nintendo 64. 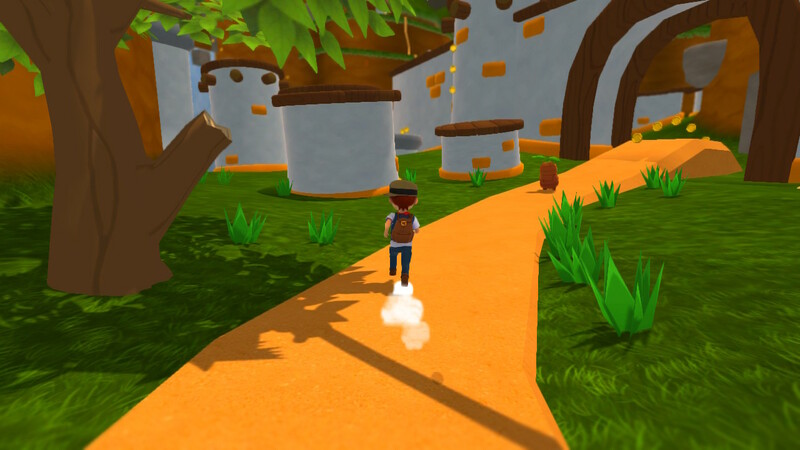 PolyKid's Poi released on other platforms like Steam, PlayStation 4, and Xbox One a year ago, and now it arrives on the Nintendo Switch. 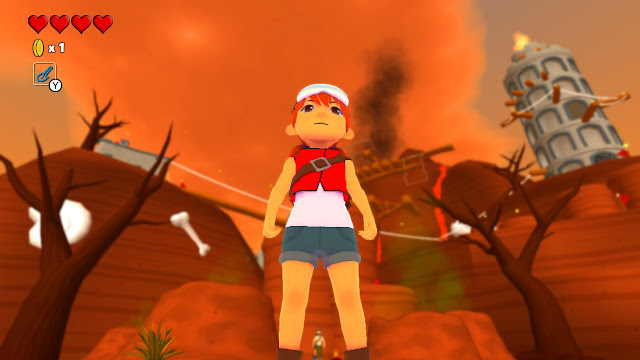 Known as Poi: Explorer Edition on the Switch, the game saw some misfortune with its release date, coming out but a week before a much more anticipated 3D platformer, a little game known as Super Mario Odyssey. Now that the excitement has died down a little for Mario's latest 3D platforming adventure, is Poi: Explorer Edition a worthwhile dessert for those who have finished Super Mario Odyssey as their main course? 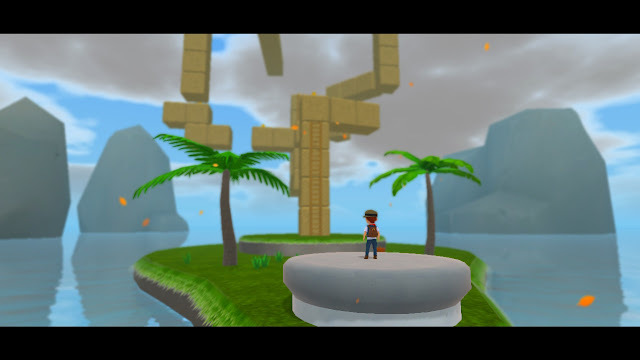 While Super Mario Odyssey changed up the Super Mario 64-style formula of its early 3D Mario predecessors, Poi takes clear inspiration from Mario 64. 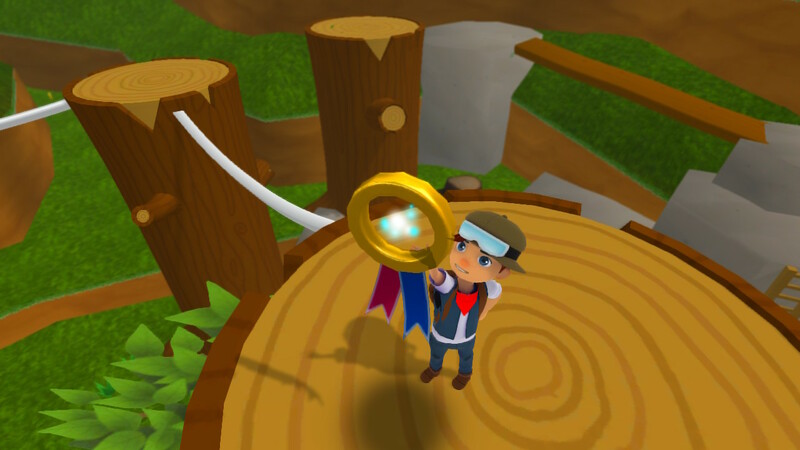 This can be seen everywhere, from when the game kicks you out of a level after collecting one of its 101 Explorer Medals (Poi's Power Star equivalent), to how you can nab 100 coins in a level, trading it for an Explorer Medal. The story of Poi has you playing as one of two young kids who set out on a journey with an old explorer to reveal the grand treasure of the world of Poi, the mysterious Milky Way Globe, as well as retrieve the old man's Explorer Medals which were lost in a torrential storm. You can switch between playing as the boy and girl character from the sky, Poi's hub, connecting every point of interest in the game. Poi's four main worlds are accessed by directing and pointing the light from the old explorer's airship to the world of your choosing through the means of pushing a compass in the direct center of the ship. Worlds open one by one after an unspecified number of Explorer Medals are collected. The first of many Explorer Medals has now been collected. Outside the four main worlds are islands that pop up around the sky, which you can get to by leaping off the airship where the game will automatically pull out a paraglider for safe travel in the hub, giving you the ability to reach the miscellaneous points of interest located within. These possess mini-games, linear obstacle courses that demand a sizable amount of platforming prowess to complete, NPC locations where characters will trade collectibles such as found Golden Gears, fossils, and discoveries in the four main worlds for Explorer Medals. 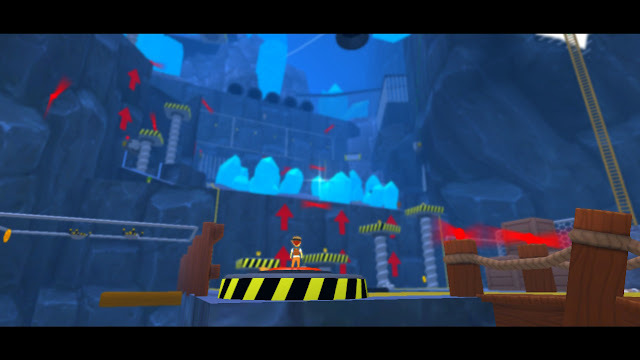 The very first challenge level consists of moving blocks. Be careful not to fall; It's a long way back up! The worlds themselves adhere quite closely to trope conventions. There is a grassy canyon, a lava mountain, a desert town, and a crystal cavern to explore for medals. What they lack in originality, they more than make up for in smart design. Levels, obstacles, and points of interests are well thought out, having positions of challenges and enemies placed cleverly with levels never being too large and thus annoying to traverse from point A to point B. Depending on the Explorer Medal objective chosen, worlds have some different obstacles placed in them, the time of a day can change, previously inaccessible areas of worlds are open, and new areas in general can appear completely. This magma-filled mountain will heat up any explorer's adventure. The Explorer Medal objectives are simple enough to know what to do with any basic reading skill, and the helpful opening video for each medal displays a notable location to head to from the start of the world. This means that both well versed, older gamers as well as young ones starting out can figure out what is necessary to do for a given Explorer Medal. Some are as simple as reaching a location through skilled platforming, while others require manipulating objects and buttons to solve them. There is seldom any kind of puzzle to solve in these objectives, but towards the end of the game there are some trials that require some thinking to overcome as you get closer to solving the mystery of the Milky Way Globe. 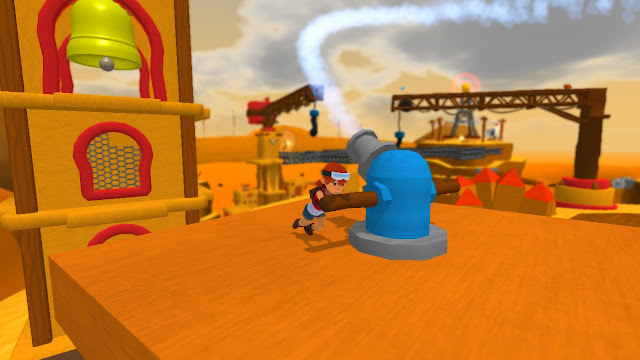 One early objective in the desert world tasks you with turning this hose to clean a dirty tower bell. The old man who helps you is actually a Master Explorer who sees something in the pair of kid characters you play as. He helps out in a myriad of ways, but one of the most important ones is through his selling of beneficial items to assist you on your adventure. These range from a shovel to dig up hidden fossils in levels, a camera to take photos of characters, a compass to point the way towards treasure, a telescope to see across vast distances in a jiffy, and an extra heart for your characters' overall health. Sure, he could REALLY help by making these free, but our Master Explorer friend is still reeling from losing all of his Explorer Medals, so it's best to cut him some slack. One of the things that generally worries me about 3D platformers from developers I'm unfamiliar with is whether they nail the controls. You can obviously design the most creative and most interested 3D platforming worlds around, yet if your game's character handles like a slippery sack of potatoes, then it doesn't really matter in the end. Fortunately, I can say that controlling your character, whether the boy or the girl, is a wonderful experience. Characters can turn on a dime, double jump, triple jump, side jump, long jump, roll, dive, and more with great ability and with well mapped controls to the Nintendo Switch and its various controller setups. While Mario still has the upper hand with his many methods of mobility, Poi's main characters don't slouch in this regard. The addition of a double jump allows for a safety net for less experienced players for which a game like Super Mario 64 might be deemed too difficult nowadays. For advanced players, such a move opens up some pretty nice speed-running possibilities if such a desire comes their way. One, two, skip to my lou. Three, four, jump till you soar. The world of Poi isn't the most technologically advanced world to run around and jump in, but it holds its own all the same. That said, it becomes a bit disappointing to see regular slow-down happen when the game isn't really pushing the Switch hardware to its limits. Regardless, these moments of dwindling frame-rate don't adversely impact the gameplay all that much, though the times that they do make for some frustrating occurrences. While things like enemies and textures aren't too impressive, environment design and humanoid characters in both playable and NPC form do a great job of showing off the skill level of Poi's artists and designers. Speaking of another part of Poi's presentation, the music is charming and full of memorable jingles and tunes to listen to. I found myself partaking in the sound test menu a short time after the ten hours it took me to collect all of the Explorer Medals -- just so I could hear and enjoy the tunes again. there's much more valuable treasure to be found inside this cavernous complex. 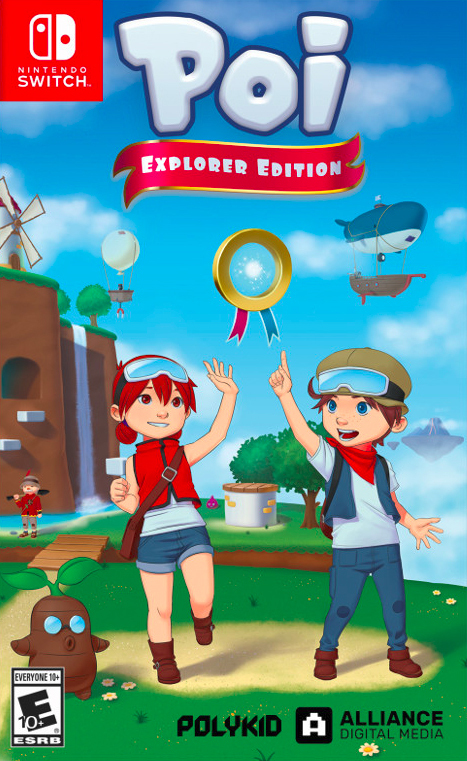 Poi: Explorer Edition may be a bit of derivative 3D platformer that doesn't push the genre too far in any kind of creative or fresh direction, and while it also has some performance problems, the game does benefit from solid design in both gameplay and within its worlds. Beating the game once is a pleasure enough, but with a New Game+ mode, the experience doesn't have to end there. Poi: Explorer Edition may not hold a candle to the greats of the 3D platformer genre, but it doesn't have to. It's an enjoyable game all the same, wrinkles and all.